Malaysia has decided to follow Turkey by opening an embassy in ‘occupied’ East Jerusalem in order to recognise it as the capital of Palestine. Malaysia’s actions go together with Turkey’s. Ankara has said it will only open the embassy after the world recognises a sovereign Palestinian state. For the ruling Barisan Nasional coalition (BN), the Palestine issue is an opportunity to unite Malaysians ahead of the 14th general election, which will be held by July 2018 at the latest. Concerns about Palestine bring out solidarity and sympathy among most Malaysians — Muslims and non-Muslims alike. Malaysian Muslims see the Palestinians as their brothers and sisters who they must help liberate from Israeli occupation. Jerusalem is particularly important to Malaysian Muslims since it is Islam’s third holy city after Mecca and Medina. Malaysian non-Muslims call for humanitarian efforts to assist the Palestinians, who they see as the victims of Israeli ‘apartheid’ and illegal occupation. But solidarity on Palestine does not mean that there are no other divisions within the Muslim-Malay community. There are at least five parties representing Malays in Malaysia. The most dominant is the ruling party — the United Malays National Organisation (UMNO). A splinter group of UMNO that is led by former prime minister Mahathir Mohamad and former deputy prime minister Muhyiddin Yassin formed an opposition party called Parti Peribumi Bersatu Malaysia. 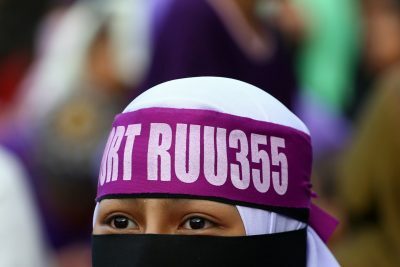 This party formed a coalition called Pakatan Harapan in 2015 with other Malay-dominated parties such as Parti Keadilan Rakyat, the Democratic Action Party and Parti Amanah Negara. Parti Amanah Negara is a splinter group of the Pan-Islamic Party (PAS) — a party with the long-term goal of creating an Islamic state in Malaysia. Muslims constitute more than 60 per cent of the Malaysian population (approximately 32 million people) and over 80 per cent of Malaysian Muslims are ethnic Malays. As shown by the 2008 and 2013 general elections, Islam is a major issue that can sway votes needed to form a ruling coalition. Many Malaysian Muslims see Palestinian issues as religious issues, so the Ruling Barisan Nasional government is presenting itself as the protector of Islam (as it has done in the past). BN believes that if the party champions Islam, it will always have Muslim Malays’ support. This is why the ruling party works closely with the Islamic bureaucracy. In the 2018 national budget, the government provided additional financial resources to empower Islam and Islamic institutions. Senator Asyraf Wajdi Dusuki (Deputy Minister in the Prime Minister’s Department in charge of Islamic affairs) said on 1 December 2017 that ‘[in 2018] alone, the Department of Islamic Development Malaysia received an additional allocation of almost 1 billion Malaysian ringgit’ (approximately US$257 million). The Deputy Minister further argued that the BN government was not shirking its responsibility of transforming Malaysia into an Islamic state. This statement of responsibility lured the support of PAS, which has openly showed interest in collaborating with the Barisan Nasional and UMNO in the upcoming general election. PAS’s intention is to have UMNO support the enactment of the hudud (Islamic criminal code) bill. The bill seeks to incorporate parts of Islamic law (such as stoning) into Malaysia’s existing legal system. It has yet to be passed by the Parliament, but regardless of its passage, UMNO and PAS will both favour a stricter interpretation of Islam. Malaysia already has a national Islamisation policy with four objectives. The first is to make Islam a special religion with state sponsorship. The second is to make Sunni Islamic teaching — the dominant sect of Islam in the world — the teaching for all Muslims in Malaysia. The third is the empowerment of the Islamic bureaucracy through the Administration of Islamic Law Act. The final is to give legitimacy to the ruling Barisan Nasional party for championing Islamic issues such as constitutionally protecting Islam as the religion of the Federation in Malaysia. So long as Najib favours a stricter interpretation of Islam, he keeps conservative Muslims and PAS on the same side as the Barisan Nasional and UMNO. The opposition Pakatan Harapan has no clear agenda on Islamisation and although many Muslims want to see the coalition clinch power, it must be able to champion and protect Islam to gain popularity. So far, Pakatan Harapan has failed to show that they can uphold an Islamic agenda (let alone fight for Malay rights) and it has thereby failed to become an alternative to the Barisan Nasional. If Pakatan Harapan fails to take such measures, the upcoming general election will see the majority of Muslims — particularly Muslim Malays — continue to vote for the Barisan Nasional and UMNO. As such, having no Islamic agenda means fewer votes for Pakatan Harapan and a win for the Barisan Nasional in Malaysia’s next general election. Professor Dr Mohd Azizuddin Mohd Sani is a Professor of Politics and International Relations at the School of International Studies, Universiti Utara Malaysia.